Purpose: Robotic surgery is a new technology which may facilitate minimally invasive surgery (MIS). The main advantages of robotic surgery include three-dimensional visualization, complete camera control, tremor filtration, absence of the fulcrum effect, and articulating instruments with additional degrees of freedom. We report our experience with robotic splenectomies in our first seventeen consecutive pediatric splenectomies. Methods: With IRB approval, we retrospectively reviewed all elective robotic splenectomies over our first 5 years using the robot. The procedures were accomplished with Da Vinci Surgical System® (Intuitive Surgical, Sunnyvale, California). Mean patient age was 12.6 years (range 5.2 – 19.1 years) with an average weight of 50.1 kg (range 10.8 – 96.9 kg). Methods for ligation of the hilar vessels changed over the course of the series. Initially, a clip applier was used, followed by a laparoscopic stapler. But these choices were less than ideal since their use requires the bedside assistant to manipulate the device instead of the console surgeon. More recently, we have used the articulating robotic Gyrus PK (Gyrus ACMI; Maple Grove, MN). This device became available in mid-2006. The robotic Gyrus PK is controlled by the console surgeon and was used to seal the hilar vessels and short gastric vessels in the last 6 patients. Results: Thirteen of the seventeen (76%) of the cases were completed using the robot. Four were converted to open for bleeding. No conversions were related to robotic instrumentation. They were, however, all related to hand held laparoscopic devices. Reasons for conversion included clip applier failure, stapler failure, trocar injury, and blunt injury to the spleen from a standard hand held laparoscopic instrument. All four conversions occurred within the first five patients. No post-operative complications occurred. The average length of stay for patients completed robotically was 1.3 days (range 1 – 3 days). 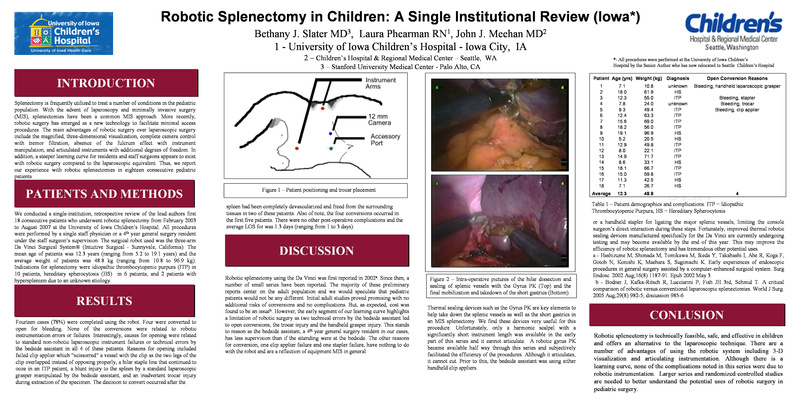 Conclusions: Robotic splenectomy is technically feasible, safe, and effective in children. There are a number of advantages of using the robotic system including the improved degrees of freedom and superior visualization. Using the bipolar technology of the robotic Gyrus PK is a satisfactory new option for sealing the vessels in minimally invasive robotic splenectomy. Larger series are required to perform an adequate comparsion between the laparoscopic and robotic approaches to MIS splenectomy.